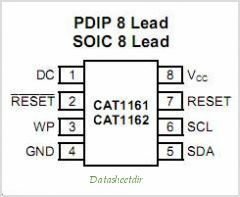 The CAT1161 CAT1162 is a complete memory and supervisory solution for microcontroller-based systems. A serial EEPROM memory (16K) with hardware memory write protection, a system power supervisor with brown out protection and a watchdog Timer are integrated together in low power CMOS technology. Memory Interface is via an IC bus. This is one package pinout of CAT1161,If you need more pinouts please download CAT1161's pdf datasheet. CAT1161 circuits will be updated soon..., now you can download the pdf datasheet to check the circuits!